Please note that I have added a downloadable demo project for Visual Studio 2005 users. Everything in the original article applies to Visual Studio 2005 usage as well, except for the bit about using ClassWizard to create your class/object associations. I'm assuming that if you are using Visual Studio 2005, you already know how to define associations, add event handlers, etc. So, just ignore the ClassWizard comments. The important thing is that if you derive your own class, you must make certain that the resource ID of your dialog bar matches the resource ID defined in the class header. If you use the derived classes that I have provided, then you simply need to name your dialog bar resource in the resource editor IDD_DIALOGBAR and you will be fine. Look over the demo and if you still have difficulty getting it implemented, drop me a line. I've seen a lot of posts lately in forums and article comments from readers wanting to know how to use owner-drawn or custom controls in a dialog bar. Even though this information is available in various articles from Microsoft, I decided to post this article as a sort of tutorial bringing all the information together into one article.... and of course, providing working examples to look at. HOWTO: How to Initialize Child Controls in a Derived CDialogBar. INFO: Using CBitmapButton in CDialogBar and CFormView. The derived classes in this example were created following the instructions from this article, primarily. To use the example classes in your app, simply follow these steps. I'm assuming that you are using Visual Studio, in my case, 6. First, from the Visual Studio main menu, click INSERT/RESOURCE and then expand DIALOG. 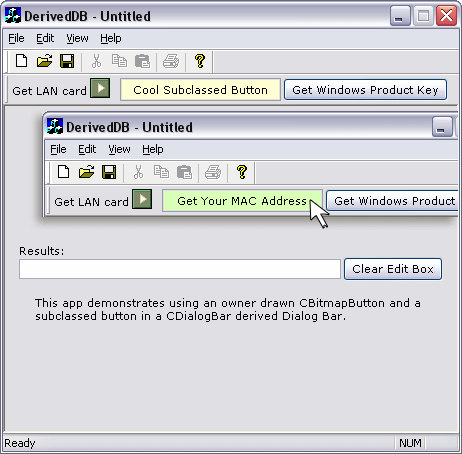 Click IDD_DIALOGBAR and click NEW. You now have a new dialog bar resource added to your project. By default, the ID of this resource is IDD_DIALOGBAR. Leave that as it is; if you change the ID, then you must change the ID in the derived class header as well. Now add the MyDlgBar.h and MyDlgBar.cpp files from the DERIVED CLASSES folder of the sample project to your project. Now you can compile and run. You will have a working dialog bar, except that you have nothing on it. So let's add an owner-drawn CBitmapButton for fun. Just add a button to the dialog bar as normal. In Properties, check caption Owner-drawn. Give it an ID of IDC_BUTTON_BITMAP and a caption of BUTTON. This is the important part here because the AutoLoad() function reads the caption to determine what bitmaps to load. Now create four bitmaps and add/import to your project one for each state: button-up, button-down, button-focus and button-disabled. Only button-up and button-down are required; the other two are optional. Once you have added/imported these, change their IDs to the following (Important: include the quotation marks): "BUTTONU", "BUTTOND", "BUTTONF" and "BUTTONX". Again, if you gave your button a different ID, you will need to change the ID here. That's it... now you have an owner-drawn CBitmapButton. The only thing left is to add a message handler for the button. That's all there is to it. Compile, run and voila!, you have a working CBitmapButton in your dialog bar. This will also work with any custom control. You can add an ActiveX control if you want. For any control that you add that needs to be initialized, subclassed, owner-drawn or whatever, just do the initialization from the Create() override function in MyDlgBar.cpp, after the call to the base class. The demo project includes a subclassed button control in the dialog bar.You can see his article for instructions on deriving your class. To subclass a button in the dialog bar, use his instructions for subclassing existing items. Look at the MyDlgBar.h and MyDlgBar.cpp files in the sample project to see how this is implemented. To use the sample class files, just add NewButton.h and NewButton.cpp to your project. Since you have more than one instruction, be sure to place brackets around your instructions under the if() statement. Also note that we do not have to specify the button as owner-drawn in the resource editor. This is because we set up our derived class (as per Chris's instructions) to force all subclassed items to be owner-drawn. That's it. Use your imagination and you can work similar customizations with any control in a dialog bar.